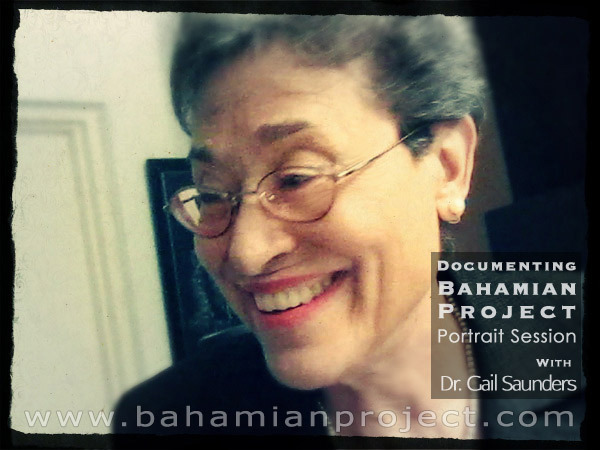 This picture of Dr Gail Saunders was taken right after her portrait session for the Bahamian Project. The final portrait images will be unveiled at the Exhibition Opening at the National Art Gallery of The Bahamas on July 11, 2013. 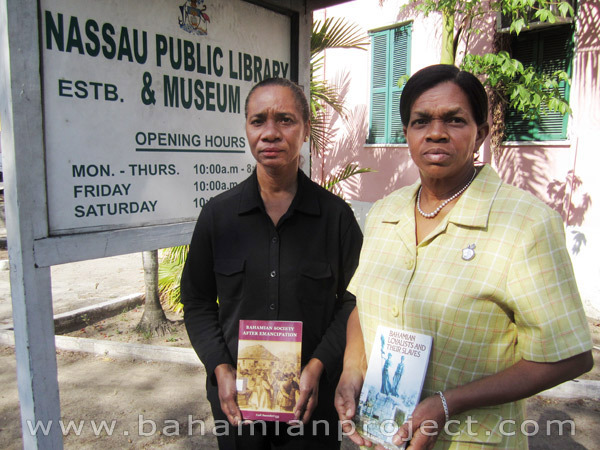 We needed books… Bahamian history books to be specific. This is what we were thinking as we planned our photo session with Dr. Gail Saunders for The Bahamian Project. Books, archives and the preservation of our history were the first things that came to mind when we thought about what we wanted to portray in her portrait. We approached the Nassau Public Library. Once I had fulfilled the formal requirements and had been thoroughly vetted, the chief librarian Mrs Murphy proved most helpful in gathering the necessary material. 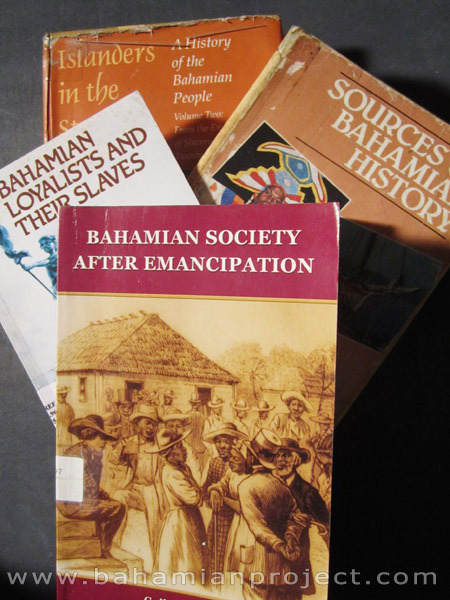 Dr. Saunders is the author and co-author of countless articles and twelve books, including Bahamian Loyalists and their Slaves, Slavery in The Bahamas, 1648-1838, Bahamian Society after Emancipation, Islanders in the Stream, Vols. 1 and 2 and Nassau’s Historic Landmarks. But Dr. Saunders has done much more than write. She has supervised the establishment of the Pompey Museum and Balcony House Museum. For ten years, she served as president of the Bahamas Historical Society and held various positions in archival and historical associations in the Caribbean and internationally. She was involved in the restoration and development of what is now the National Art Gallery of The Bahamas and served as chairman of the board. She has been a teacher, an author, an archivist but foremost she has always been a historian. She developed and nurtured The Department of Archives and directed it for thirty-three years. Dr. Saunders has a passion for history. She believes it is important to the growth of a country and its people. Some time ago, I read an article on Dr. Saunders, written by Sonia Farmer and published in The Nassau Guardian. To [Dr. Saunders], history is a vital part of a society’s self-identity and pride. In fact, she believes Bahamian history should be a mandatory paper in the Bahamas General Certificate of Secondary Education (BGCSE) exams in order to instill a sense of self-assurance in every Bahamian. Indeed, she believes that if that were the case, many young Bahamians in school would be exposed to heroes in all parts of society — great Bahamian politicians, heroes, artists, and thinkers. That quote stood out to me and still does, probably because it is what the Bahamian Project is all about… recognizing our heroes for the benefit of our emerging and future generations. Attention; Dr. Gail Saunders.`I have a copy of your book “Islanders in the Stream,” I bought the book at the Gerace Research Center at least 8 or 9 years ago. Today, as I was finally putting all my ancestors on ancestry.com I came across a relative born on San Salvador in 1806. Mary Amelia Russell was the daughter of John Russell and married George Washington Walthour of Liberty County, Ga. My work on San Salvador was and still is archival work, first for Dr. Gary Fry from YSU and then for Dr. Jeffrey Blick from GCSU. I have always wondered why I felt so at home on that particular island. There is a long history on the Walthours’ and way too long for a message. As I researched my tree I was always proud of the fact that the Walthours in Pennsylvania were hard working farmers, coal miners, and when the industrial revolution hit, worked in the steel mills of the north. Now much to my dismay the Walthour brothers who stayed in Georgia owned plantations and slaves. I am absolutely ashamed.